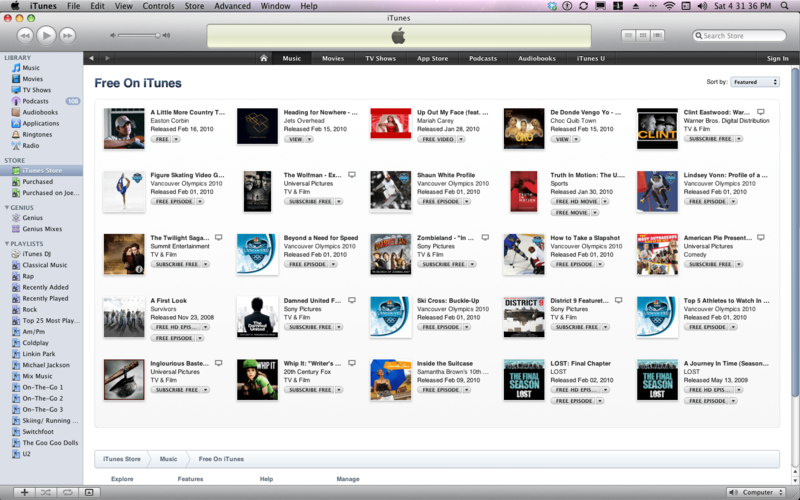 Looking to gain a larger iTunes Library or just trying to be frugal when shopping on iTunes? Every week, Apple has free songs of the week, where you can download and keep the songs as long as you want. They release a good selection of songs such as a song I downloaded called “Under Control” by Parachute or “Fireflies” by Owl City a couple of months before it hit the Top 100. To get the free songs you go to iTunes home page and scroll down to ” Free Single of the Week”, or “Free Music Video of the Week”, or if you want to view the free music, music videos, and movies you can just goto the bottom and click on “Free on iTunes’. The only thing is that there is usually only one song and music video per a week and if you don’t get the song by the end of the week you have to pay for it and the movies are usually older movies and not that great, but not always. Clearly, if your looking to expand your library or listen to some new music, launch iTunes and click away at the “Free on iTunes” selection!